Britain’s Supreme Court ruled (8-3) today that the UK government must get parliamentary approval to begin the process of leaving the European Union. Prime Minister Theresa May’s plans to trigger Article 50 of the Lisbon Accord in March 2017 to begin the Brexit process, could be delayed as a result of this ruling. However, the PM’s spokesman said that the plan to leave the EU remains unaffected and Brexit will proceed as planned. 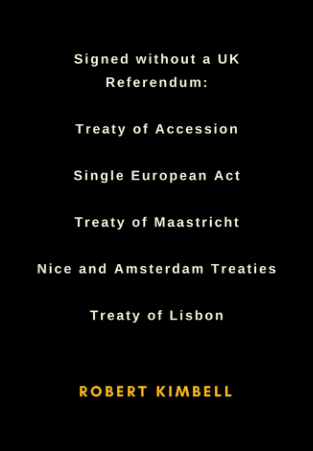 List of Treaties and Acts signed without the benefit of a UK referendum, nor signed with any requirements set out by UK Supreme Court Judges. The highest court in Britain also decided today (unanimously) that there’s no requirement to consult the governments of Northern Ireland, Scotland or Wales prior to invoking Article 50 because the United Kingdom entered the European Union as a single entity, therefore, the UK must leave the European Union as a single entity. In defense of the high court, the Brexit referendum wasn’t a constitutional vote where the government was legally bound via a quid pro quo with voters to enforce Brexit, rather, it was a vote centered on finding the will of the public regarding continued EU membership. British voters, after having voted in a referendum to tell the government of its wishes in regards to EU membership, are now informed by the UK Supreme Court that Parliamentary approval must also occur. The bar keeps raising, but it’s only serving to make UK citizens more determined to have their voices heard and for Brexit to actually occur. Although today’s ruling might be seen as a setback for the Prime Minister in some quarters, the Supreme Court ruling has caused Britons to demand even more vociferously for a ‘Hard Brexit’. It seems the Supreme Court ruling requiring Parliamentary approval before Brexit might turn out to be good news after all for Prime Minister Theresa May and for millions of Brexiters. By Letter to Britain in Brexit, Britain, Theresa May on January 25, 2017 .